JACKPAK IS THE PERFECT ON-THE-GO ACCESSORY FOR EMERGENCIES AND EVERYDAY SITUATIONS. This portable powerhouse delivers a tremendous output of 600 peak amps with a normal cranking current output range of 300 – 400A. When it comes time to recharge, simply plug it in using the convenient 12-volt DC or 110-volt AC charging adapters. 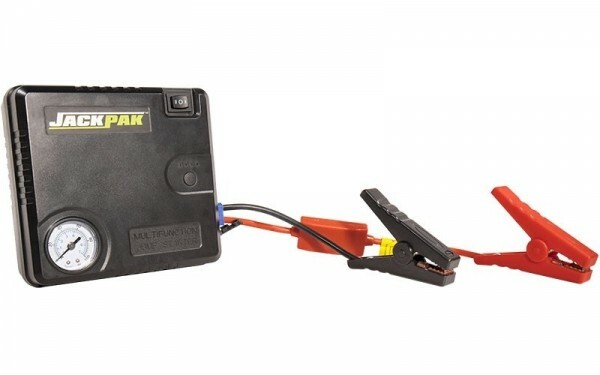 The JackPak is a state-of-the-art lithium-ion jump starter that takes advantage of the latest in battery technology, making it small and lightweight, yet extremely powerful. It is a versatile, 4-in-1 portable power supply that acts as the perfect roadside assistant tool. 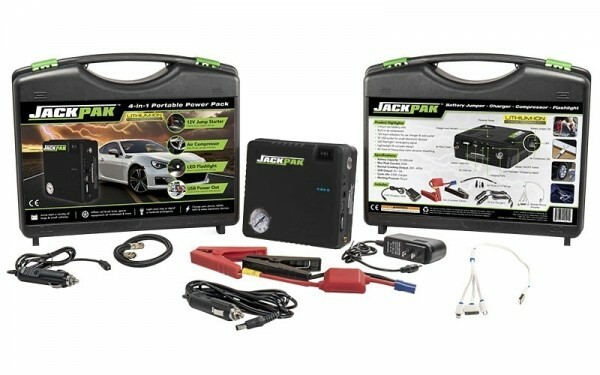 Whether you need to jump start your car, light truck, RV, boat or snowmobile, pressurize a tire, charge a small electronic device or brightly illuminate your way through the dark, the small, lightweight JackPak does it all. 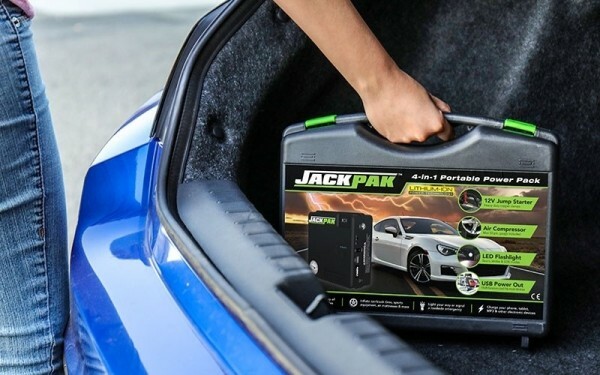 Having an air compressor with you at all times is just as important as having a jump starter, and that’s what sets the JackPak apart from all others. 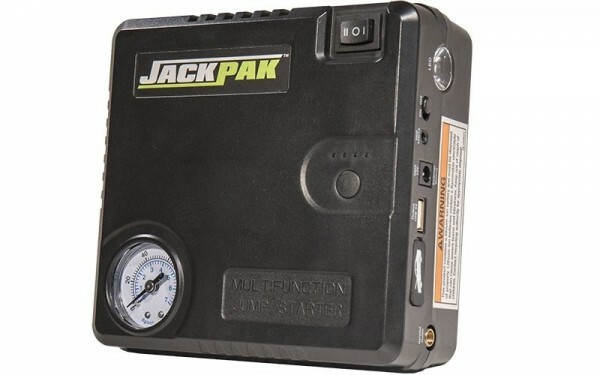 The JackPak’s built-in air compressor features a 356 mm flexible air hose with durable screw-on couplers for hands-free connection. Its proprietary design boasts a working pressure of 50 psi, which easily satisfies the maximum pressure threshold for most cars, trucks and SUVs. Rugged, high-density plastic construction ensures a non-conducive surface for safe handling when electrical current is active, and the easy-to-read air pressure gauge is displayed prominently on the face of the device, securely covered by a transparent, impact-resistant plastic lens. A convenient, durable carrying case houses the power supply unit with all standard accessories. Quickly charge most handheld or personal electronic equipment with a proprietary USB jack. Includes multifunctional adapter cord that interfaces with iPhone™, iPad™ and Android™ devices. Cable is constructed with stiff, tear-resistant rubber to ensure superior durability during high-intensity movement and travel. Sturdy, non-conductive nylon handles are easy to compress when opening the encapsulated copper jaw clamps. These tiny but powerful clamps are small enough to access 12-volt terminals located in tight areas such as vehicle trunks or service compartments. Jagged alligator teeth remain permanently fixed, even if terminals are corroded or dirty. Within seconds, the 12,000mAh battery pack delivers 600 peak amps with a normal cranking current output range of 300 – 400A. The proprietary air compressor is just what you need for most air-filling applications. 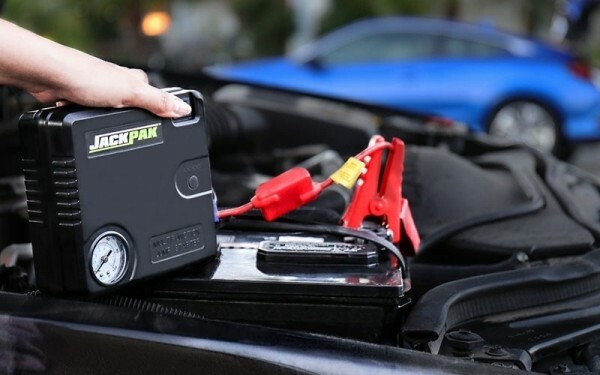 The miniature-but-powerful compressor has a 50 psi working pressure, so whether it’s a football, truck tire, air mattress or other inflatable object, JackPak can most likely handle it with ease. Rust and moisture-resistant brass knobs quickly screw on and off your vehicle’s valve stem, preventing air from escaping while you connect and disconnect the hose. Heavy-duty woven nylon abrasion sheathing protects the air hose from excessive pinching and damage under most operating conditions. Holding a round button on the front activates a powerful, continuous, front-facing LED flashlight. Pressing the button again activates a quick-flashing strobe feature, and a third press activates the SOS function. Depending on your lighting or emergency needs, this amazing power supply pack can signal for help, light the area while you change a tire, or light a path through dark terrain.